Al Jewer is a respected record producer, engineer, artist and composer, but most importantly a terrific flute player. As a studio musician for the last 30 years, his work in all genres of music reads like a quilt of musical styles. He has played Early Music, Classical, Folk, Jazz, Celtic, Reggae, Rock, Poetry Fusion and Experimental music. 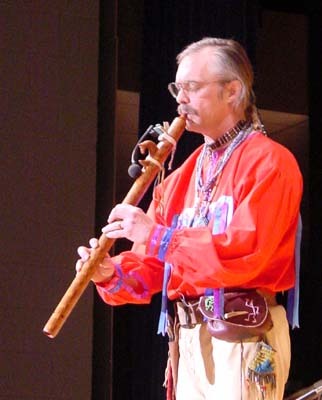 However, in 1986 he discovered the beauty of the Native American flute and its simple yet profound music. Through this experience Al has found his true musical voice. He started playing flute in 1971, and has studied with many teachers including Emil Moro in Detroit, Jackie Hofto at Interlochen Arts Academy (Interlochen, Michigan), and Dr. Robert K Webb at the University of Wisconsin. He has been principal alto flute with the Whitewater Flute Choir (Whitewater, Wisconsin) for the last 18 years, and plays classical duets as a member of the Soverhill Duo and quartets with the Whitewater String Quartet. Al founded Laughing Cat Studio in 1984 as a vehicle to record and produce the excellent music of the Midwest including Blackhawk, David Storei and Roxanne Neat, Natty Nation, Weekend Wages and others. In 1994 he started Laughing Cat Records to help bring this fine music directly to the listener. Music appearing on Laughing Cat Records includes Ambient, Native American, Reggae, Classical and Folk. Al's unique touch as musician, engineer and producer lends a special sound to all these recordings. 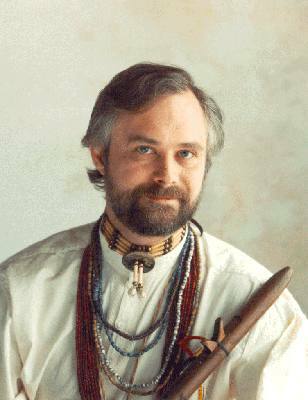 Starting in 1988, Al worked for eight years with Wisconsin Native-influenced artist Blackhawk, playing music of the Native American flute and original folk ballads, both in live performance and on eight albums including My Fathers Voice, Journey of the Spirit and others. In late 1995, Al spent eight months in the studio and created Prairie Plain Song, which is his personal statement of peace and harmony with nature. Al says "I let the project go at its own pace, never forcing it to get done. Sometimes songs came quickly, but others took a great deal of time. There was a period of two months where nothing happened at all. However, at the end, the last three songs came in two weeks during a time of great inspiration". Experiences with Native American Lakota and Cree culture have had a great influence on Al's life. He has participated in sacred sweat lodges and has learned about the history and world view of the Native American culture; these experiences have had a profound effect both in his life and in his music. "We are all part of the hoop of life. I thank the Great Spirit, Father Sky and Mother Earth for the gift of music to express my feelings. For me, this is the greatest gift anyone could receive." Al's has also worked with CEDAR WIND, a duo with Christine Ibach, a Wisconsin traditional Native Flute player of Cree heritage. Their first recording was released March 1998, and is titled Feather on the Wind. This recording features all original material; the songs are Native flute melodies with Alto and Bass flute harmonies and the relaxing sounds of nature. Their second recording, Kindred Spirits, was released April, 2001. Al's next project was a duet CD with Andy Mitran called Two Trees. This recording features notable guest artists including cellist David Darling, guitarist Vinnie Zummo, Chapman Stick player Arthur Durkee and others. Two Trees made its radio debut at #4 on the nationwide charts and went on to be in the top 1% of airplay for 2003. Al and Andy have appeared as featured artists on Chicago's WGN Morning News and in a live living room concert for John Diliberto's Echoes program, a nationwide syndicated radio show on the PRI network. In February of 2005 Al's second solo album, River Crossing, was released. It is a wonderful musical journey for everyone who enjoyed Prairie Plain Song. "I have had exciting new ideas and wonderful inspiration this year. This music touches everyone who listens with an open heart." River Crossing went on to chart #4 on the nationwide New Age radio airplay chart.